A place to show your scratchbuilt 1/43 scale slotcar models. 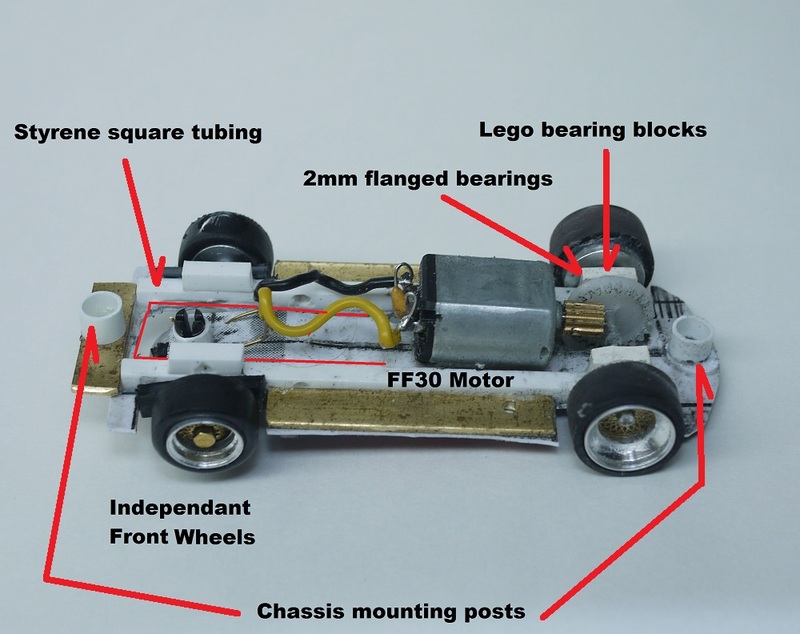 I built this chassis mainly to see whether a Chase Cars printed steering unit would be of use to 1/43 modellers. The AFX Turbo motor is mounted in a thin brass subframe, which is screwed to a sheet of aluminium. I sent it to Peter to try out on the Desmo. He said that it went well but the steering was catching on the motor wires. I had left rather too much motor wire in place, which I will reduce for the Pronomag proxy. Peter also said that, especially with the black painted wheels, that he could not tell it had steering whilst it was moving. I know, but I like it! 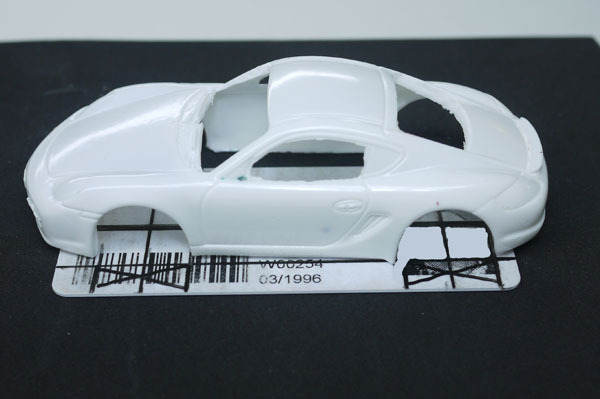 The body is a Heller Lancia Beta Turbo from a 1/43 kit. Yeah but slotter, I think people afe getting fed up of having to trawl and search through the 100's of threads jjst to find a certain bit of information on scratchbuilding in this scale. Nice chassis and car Lloyd. 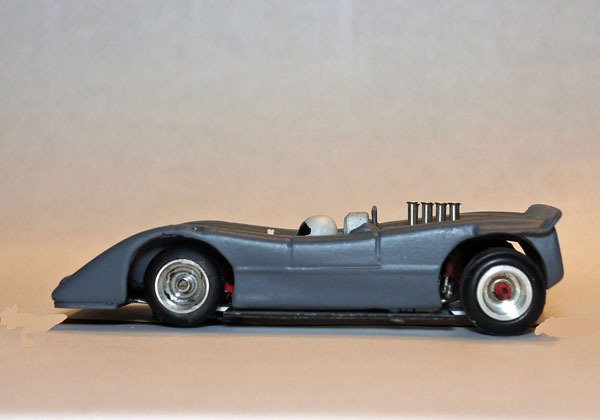 I could never see the ackerman steering on 1/24 scale cars, so I doubt I would notice in 1/43. Still and ambitious well executed plan. The cat is let out of the bag. It´s just a question what this has to do with scratchbuilding. If you want to sell, put it in the buy and sell - section, not into scratchbuilding. I cannot imagine that this was the aim of the idea of opening a scratchbuilders´thread. And if, I will put in my list of all cars I have ready for copying - ca. 220 - here, too. Last edited by schackel; 01-09-2016, 03:03 AM. I had the idea of this thread because finding information on 1 43 scale scratch building is difficult and often a confusing process, I had the idea so we could share ideas, good towards improving projects etc... Thus helping the community and the people new to the community. This Mercury was a toy from the Big M burger store. Although a bit too small I liked it because it offers a lot of possibilities to convert it into various rat rods and similar vehicles. 3. Glue everything together and let it harden carefully. The filler I used was resolved black styrene. It extends the drying process, but it improves the final shaping because it is black like the body. On the first picture you see the tools I used, two differently sized Tamiya photoetched micro saws and one of my selfmade razor blade saws. The latter one I primarily use for surgical operations at plastic people, to change poses etc. It is so thin that you don´t have any noticeable loss of material at the cuts. Last but not least the resin cast. Last edited by schackel; 01-09-2016, 11:08 AM. Lookd amazing, keep us updated with this build. Last edited by Wet Coast Racer; 01-15-2016, 11:52 PM. OK, I have already made changes to this design with the first being the name. Gift card probably more accurately describes the card in use as there are no embossed numbers or name. I had an old medical health card sitting on my work bench, and as I was working on a 1/43 scale car, it occurred to me that these cards were a perfect size for 1/43 scale slot cars. Wafer thin, durable and the cost was right. I had to try it. So I built the first chassis which was a sidewinder affair, but didn't take any pictures. The results were very good so I abandoned my own custom resin chassis and focused on the Gift Card Chassis. 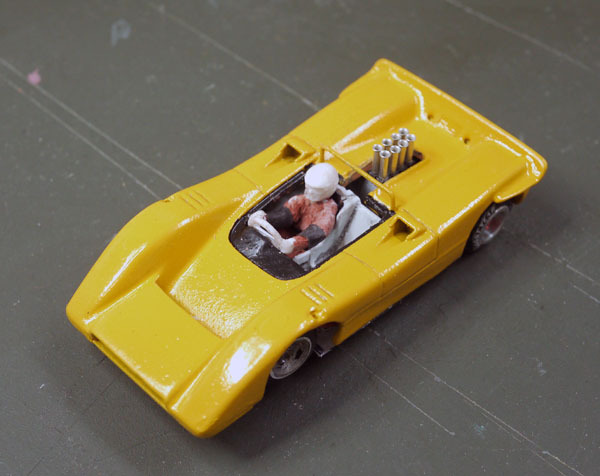 (GCC) My McLaren M8 is built on a this first sidewinder chassis, and the Cayman uses the second. 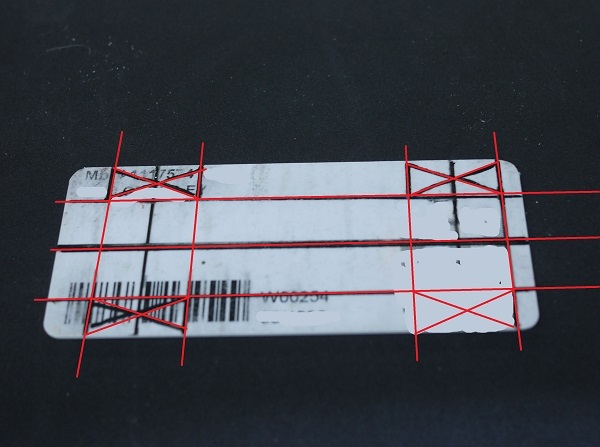 Cut the gift card to the right width, and then mark out the wheel well openings. Take the the rough opening marks and then using a square straight edge mark out all the important cuts with a marker I like to make the marks on the opposite side of the card from the gift card logo. The colorful logos are nice feature on the bottom of the chassis. I also use small one piece lego block . I cut the nubbin off and it leaves you with a perfectly centered hole at the exact height you need. This hole is then enlarged to accept the 2mm flanged bearings for the rear axle. On the sidewinder these "Bearing Blocks" don't even need to be cut as they fit perfectly between the wheel wells, as shown on this earlier chassis. For the inline chassis these blocks need to be trimmed down to fit. In this first attempt I cut them down to the minimum size, but after the build realized that I could have left the crown gear side block longer to act as a support stop to keep the crown gear at the right spot. 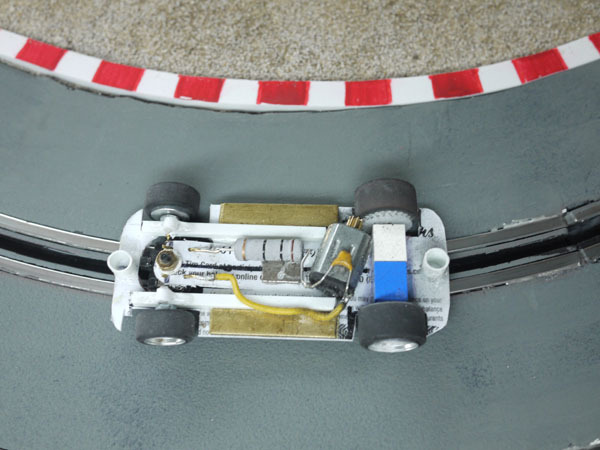 The end result is a chassis that looks like this. I have tired to identify all the parts and as a pictures says a thousand words, I hope you can see for yourself what I might have left out. I will pay some extra attention to the guide flag arm. This arm is cut back to a point about midway in the chassis. I learned to drill end stop holes, before scribing the card with a hobby knife. The end stop holes provide a crucial stop point, so that even if the knife gets away on you it won't scribe bast the hole. Now the good thing about this guide arm is that it now allows you adjust the height of the guide flag for you particular build. I go ahed and build the rest of the chassis, and the wheels and then make the adjustment to the guide flag. First attempt I left the flag arm flexible, but it resulted in a "hoppy ride" . To prevent this I find the right height and then just a couple of drops of hot glue near the Flag end secure the guide, so the chassis now longer hops up when under acceleration. 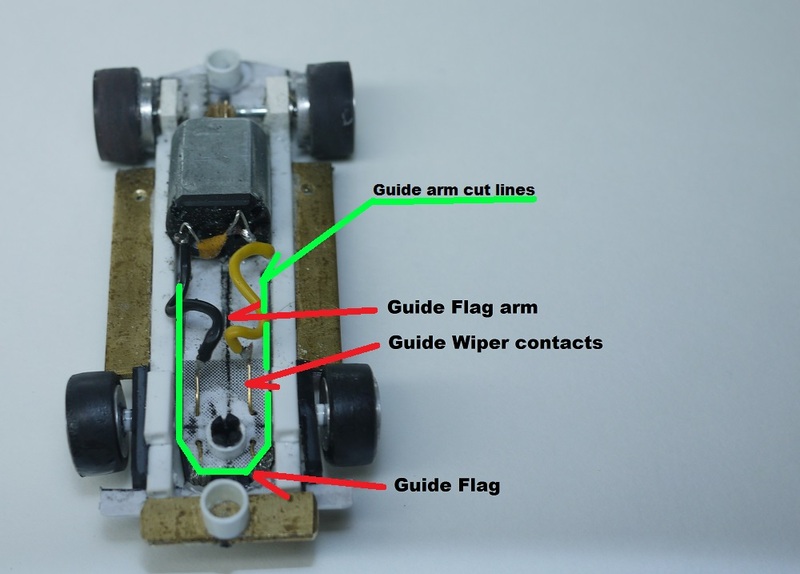 Finally as the guide flag in a position between the front wheels it becomes necessary to go to an independent front wheel assembly as you can not have a continuous front axle. 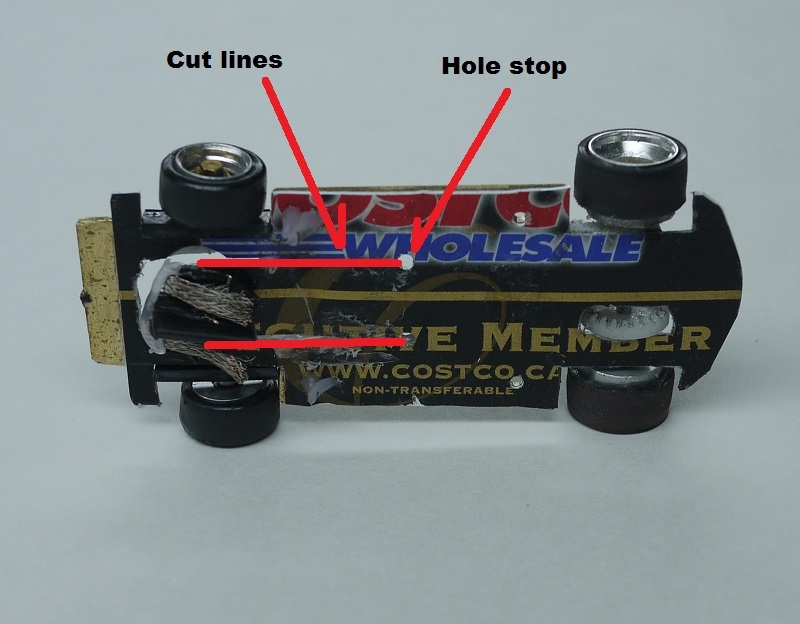 Here is the assembly that I came up with. I had tiny brass lag bolts( Builders in Scale) that I use in my other hobby, These become the front axle pins. Guide holes are pre-drilled in the square styrene stringers on the chassis and these lag bots are just torqued in. Using the the scale wheels I found it is necessary to add a small spacer, so when you tighten down the lag bolt you don't damage the fine photo etch brass inserts. The one in the picture is a little worse for wear as I made this discovery the hard way. The spacer however prevents this from happening. Now turning to the rubber for a moment. The rubber that comes with the wheels is of good quality and actually performs well on the track, but not quite as good as UT tires. I never had any UT tires that would fit these rims, but made a discovery last night. I took the Gel Claw NASCAR tires and turned them inside out. You are left with the flat side against the rim and the two out side ridges are now exposed. You can then just these sand off. I use an over sized rim chucked in a motor tool for this, but the urethane sands easily and this could be done after the tires are installed, using the chassis and some sandpaper on the track. The width is not quite right, but I use silicone to adhere the UT tires to the rim and just line up the tire to the outside edge of the rim. Not perfect but it puts the necessary UT rubber on these rims which is important for No Mag racing. Two of these chassis are being entered into the ProNoMag that Peter is hosting. So I will find out how they perform. I can tell you that if you add a magnet to these, they will kick the *** off a Stock go car. Here are some pictures of the GCC(sidewinder) showing how low the profile is and the fact there is room to add an interior even in this small open top racers. Finally I want to say something about 1/43 scale. It is not mainsteam and does not get mentioned much, but I want to say I am enjoying my time in the scale immensely. 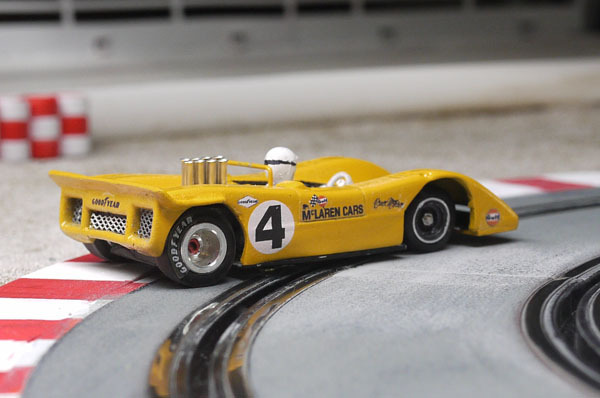 I am an Old guy and have been around slot cars since the old Cox Mag chassis back in the 60's. I am here to say that 1/43 scale cars can be built and run. With the fact it is close to O scale, there are numerous buildings and structures for creating a layout. I am also a model railroader so believable track to scenery ratio's are important to me. 1/43 scale fits the bill nicely for this requirement, without it taking up a whole room if you don't have it. My recently constructed Klusken Hills track sits on top of some storage room shelves and measures 4'X12'. It provides a good entertaining track plan, and affords me lots of areas to satisfy my desire for realistic scenery. All the gears, motors and other parts I have picked up off eBay. Literally I have bought bagfuls of motors, gear, bearings etc. I bet I got enough parts now to build 30 cars, and i doubt I spent $150 buying them. Finally there is a vast array of 1/43 scale diecast cars for sale. 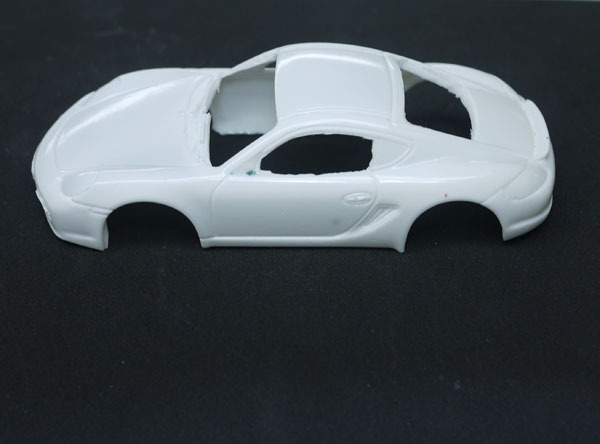 Learn to cast resin and you will never be short of a car to model, but this is where it gets expensive. These diecasts go from $8 to $200, so I am always on the look out for cost effective models. This is where forums, cottage industries and sharing comes into play. Tutorials on building , casting, painting, etc go along way to making the hobby enjoyable. At the end of the day that is what a hobby should be. Enjoyable fun that doesn't cost an arm an leg. 1/43 slot cars are doing that for me. Last edited by YHR; 01-10-2016, 02:17 PM.